Cinematographer Natty aka Natraj has been exhibiting some iconic performances in all his films, but shot to fame with his previous release ‘Sathuranga Vettai’. Currently he is cranking camera for Vijay’s upcoming film ‘Puli’, directed by Chimbu Devan. Natraj had started working on his film ‘Katham Katham’ alongside Nanda, much prior to the release of Sathuranga Vettai. Recently, the film’s climax was completed and the producers are planning to release it by end of March. It is worth mention that few days earlier Kamal Haasan has expressed his wishes to the team, especially to the hero Nandha and Natarajan. Kamal recollects his memories of his association with director Babu Thooyavan's father who was working in Devar films. He said he is sure that this talent must have been incorporated in his son's DNA too. He further extended his wishes to editor Muthulakshmi, a relative of director-actor Santhana Bharathi and she has worked with Raajkamal Films earlier. He finally wished the producer and the entire team. Katham Katham revolves around two cops and how they deal with corruption, one known for his honesty and other one for fraudulent nature. When these cops indirectly influence each other, their lanes change, somewhere close on the lines of Rajnikanth’s Ranga. Sri Thenandal Films has acquired the theatrical rights of this film from Appu Movies G Karthik. Natty plays a dishonest cop and Nanda as a sincere one. The film also stars Sanam Shetty, Saarika and Sangeetha in important roles. 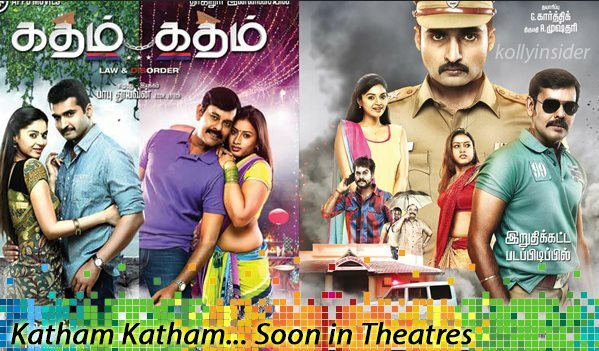 Produced by Appu Movies, Katham Katham has music by Taj Noor and cinematography by UK Senthil Kumar. Katham Katham is a famous dialogue spoken by Superstar in Baba. The movie is in the final phase expected to be release in March end. Appu Movies presents Katham Katham. Trailer of the upcoming Tamil feature film starring Natty of Sathuranka Vettai fame & Nanda.